FDNY Captain Paul Washington jerked his minivan to a halt on East 123rd Street near Second Avenue to find a line of impatient students waiting for him. There was just enough light in the settling dusk for him to see annoyed expressions on the faces turned his way as he jumped out. It was 7:45 p.m., and he should have been in East Harlem 30 minutes ago, but traffic from his Brooklyn firehouse delayed him. Washington turned to the black firefighter who drove in with him from Engine 234. “Can you find a place to park? I’m going to grab this stuff and head downstairs,” he said, hefting a box of tutorial workbooks. Inside the Taino Towers, a huge housing complex in the center of Spanish Harlem, a/k/a El Barrio, six more firefighters waited for him. 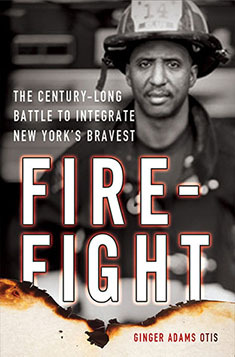 Like him, they were all members of the Vulcan Society, the official fraternal organization for blacks who made it into the FDNY. He hurried everyone a flight below into the basement room the Vulcans rented for the night. Something about the line of students outside nagged at him — the cluster of whites in the back. That alone wasn’t unusual. A few always showed up at the Vulcan classes, even though everyone knew the tutorials were primarily meant for blacks studying to become firefighters. But tonight that brief glance wedged itself into his head, probably because of the e-mail he received earlier warning him that some whites were planning to crash his event. It came from a fellow FDNY officer who wasn’t a supporter of the Vulcans’ cause, but he felt honor-bound to let Washington know something was brewing. “I don’t like to see anyone blindsided,” the officer wrote. Washington wondered what the night might bring … If some white guys wanted to attend his class, let them come, he decided.